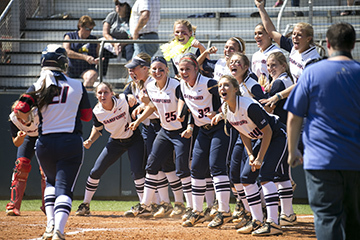 The Samford softball Bulldogs won the 2016 Southern Conference regular season championship May 7 with a weekend sweep of UNCG. It was softball’s first conference championship in 25 years and its first since Samford joined the Southern Conference. The top-seeded Bulldogs will open SoCon tournament play Thursday, May 12, with an 11:30 a.m. CDT contest against the winner of the Wednesday game between 4th seed UNCG and 5th seed East Tennessee State. The double-elimination tournament will be held in Greensboro, North Carolina. Samford's Megan Dowdy and Mollie Hanson were named Southern Conference Player and Pitcher of the Year, respectively, as voted by the league's head coaches and announced by the conference office. Samford's Mandy Burford was tabbed Coach of the Year.